Some of the best activism is happening in Britain—but in policy terms, payoff has been slight. In a worn leather armchair on London’s bare Blackheath, a middle-aged man is reading Cormac McCarthy’s The Road, in which a father and son trudge through a lifeless postapocalyptic world. Around him spreads a city of colorful pop-up tents, kitchens under canvas, composting toilets and a solar-powered cinema. The bright pink banner over the entrance reads, Capitalism Is Crisis. 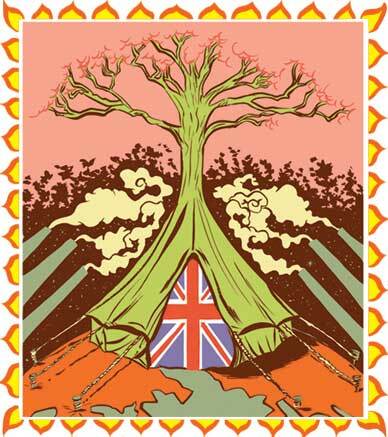 Welcome to the 2009 Camp for Climate Action, a weeklong, late-summer strategy session, teach-in and experiment in sustainable living by Britain’s direct-action movement against climate change. The offspring of a liaison between anticapitalist protesters and environmental activists, Climate Camp was born in a field outside the G-8 summit in Scotland in 2005–the one where former Prime Minister Tony Blair vowed to make climate change a priority, helping to push the issue up the media agenda. Since then campers have invaded coal-fired power stations, protested the planned third runway at London’s Heathrow Airport ("We are armed…only with peer-reviewed science") and pitched their tents in the heart of the City of London to highlight the connections between profit and carbon abuse. With other groups from the growing movement for climate justice–from urban activists to indigenous campaigners–the camp will have a loud presence in Copenhagen in December, aiming to turn the conference for a day into a People’s Summit. Previous gatherings have been plagued by overzealous policing, which hijacked headlines and detracted from the camp’s main messages–no new coal, no new runways, an end to endless growth–but at the Blackheath camp the police have been on their best behavior. Blackheath is still common land, where any local is in theory free to graze his sheep. Wat Tyler’s Peasant Revolt assembled here in 1381 to march against the government, as did the Kent rebellion in 1450 and suffragettes in the early twentieth century. The campers see themselves as heirs to those traditions, and in a sense they are. If you are young (or not so young), idealistic and radical in Britain now, this is where you go for community, engagement and direct-action training. In the last week of August as many as 3,000 people visited Blackheath, to camp, to attend a workshop or just to try a smoothie made in a bicycle-powered blender. The atmosphere was somewhere between a conference and a festival. In the milky light of the main marquee, geeky young men in glasses, girls in recycled frocks and seasoned old campaigners discussed climate science and carbon trading, composting and convergence with visitors from think tanks and environmental NGOs. A vigorous daily role-playing game taught would-be protesters how to deal with police tactics. Hours were spent debating the movement’s future. How to reach out to "workers," older people, ethnic minorities? "Edgy" and radical, or "fluffy" and more accessible? Anticapitalist or merely antigrowth? Climate Camp has been criticized for being too inward-looking, and all this navel-gazing has its self-indulgent aspect. But then, movements like this one–mostly young and white and middle class–have always been about transforming their participants as well as the wider world. Climate Camp has no (official) leaders; decisions are made by consensus using a code of hand signals, which can take some time. And while some punters may just be along for the ride, a growing number see civil disobedience as the only sane response to a desperate situation and are willing to risk arrest and serious injury. The camp is the largest node in a network of direct-action groups that have sprung up in Britain over the past five years; their tactics range from the physically courageous to the whimsically theatrical. Protesters have scaled power-station towers, stopped coal trains and super-glued themselves to corporate headquarters. Members of Plane Stupid shut down airports by climbing on top of short-haul jets or chaining themselves to the wheels. This summer Climate Rush, in suffragette petticoats, caught the tabloids’ attention by dumping manure on the driveway of Jeremy Clarkson, the BBC’s motormouthed car promoter. A "Climate Casino" held in full evening dress outside the European Climate Exchange dramatized one of the Blackheath camp’s key arguments: that market-based solutions like carbon trading will not deliver the necessary emission reductions and risks producing a new financial bubble. The performance inspired a Channel 4 TV news investigation that confirmed the protesters’ case: large profits are made through carbon trading, but almost no carbon is saved. The direct-action movement keeps climate change in the news, draws attention to key battlegrounds, expands the space for dissent, brings urgency and flair to an issue that can seem distant or numbingly technical. It can also claim a couple of concrete victories, though the recession has had as much to do with both. In October the German power company E.ON shelved its plans to expand the Kingsnorth coal-fired power station in Kent–site of a previous camp–after failing to win an EU grant for a carbon capture and storage project, which went instead to an existing plant in Yorkshire. The planning application for Heathrow’s third runway has also been put on ice until after the next election; the Conservatives, who are almost certain to win, have said they will scrap the development. The runway has attracted widespread opposition, not least from local residents and from the government’s advisory body, the Committee on Climate Change. Greenpeace (the original environmental direct-action group) has bought a plot of land in the runway’s path with the help of three celebrities; more than 57,000 people have joined "Airplot" as nominal legal owners, theoretically too many to evict or take to court. In most ways Britain is well ahead of the United States on climate change, though that’s not saying much. Out-and-out climate science deniers are almost as rare as creationists. Being green carries a market premium and a certain cachet; knowing where your asparagus comes from is an accepted part of affluent consumer consciousness. Most of the culture talks the talk; the elegantly simple 10:10 Campaign, recently launched by Franny Armstrong, director of The Age of Stupid, and supported by the Guardian newspaper, has persuaded more than 40,000 people and nearly 2,000 businesses (including E.ON–a little greenwash here) as well as the leaders of the three major parties to pledge to reduce their emissions by 10 percent in the year 2010. Britain has a venerable rural conservation movement, supported by the same people who marched against Labour’s fox-hunting ban and by Prince Charles, that well-known organic farmer. Jumping onto the green bandwagon was no big leap for David Cameron when he rebranded the Tory Party in 2006, replacing its blue torch logo with a green scribbled tree. Since then politicians of all stripes have vied for the green high ground. In 2008 the Climate Change Act made Britain the first country to commit to a legally binding cut in greenhouse gas emissions, 80 percent against 1990 levels by 2050. This summer Ed Miliband, Labour’s tireless secretary for energy and climate change, published a sweeping and detailed "Low Carbon Transition Plan," which laid out how the first stage of that cut would be achieved and promised 400,000 new sustainable jobs by 2015, firmly tying economic recovery to energy reform. And yet, on most objective measures and despite recent improvements, Britain remains one of Europe’s worst offenders on greenhouse gas emissions. In 2007, according to EU statistics, the renewable share of Britain’s energy consumption was the lowest percentage of all the EU countries (Malta’s figure is not listed). Its total emissions and emissions from energy production were exceeded only by Germany’s; those from waste were the highest in the EU. What has kept the government from putting its money where its mouth is–and what does the movement need to do to bring about real change? The story of the Vestas factory may hold a few clues. Last July, a few days after Miliband launched his transition plan, the Danish company Vestas announced it was closing its wind turbine factory on the Isle of Wight–the only such plant in Britain–with the loss of some 600 jobs. There was an instant uproar, with calls for the government to bail out Vestas as it had the banks; the dispute became a major embarrassment for Miliband. A handful of cadres from Workers’ Climate Action–an offshoot of Climate Camp formed by members of a Trotskyist group called Workers’ Liberty–had been talking to Vestas employees since the closure was first rumored, laying the groundwork for a factory occupation. When the time came, some thirty workers locked themselves in the building, supported from the outside by local residents and assorted climate campaigners, who brought their tents and their energy and tossed in food-stuffed tennis balls to help sustain morale. The occupation lasted nineteen days and got plenty of press attention, but the factory still closed. The Vestas plant manufactured turbines for the American market (a smaller size than those used here onshore); it made both economic and environmental sense to move production to the United States. Miliband clearly wanted to keep the factory open; when sacked Vestas workers demonstrated against him at the Trade Union Congress, he awkwardly joined the applause, explaining that the firm had in fact refused an offer of government funds. Nor was it willing to convert the plant to make turbines for Britain. The British market is too small and too uncertain, he explained, mainly because of local objections to wind farms and a tortuous planning process. A new planning authority will make it easier to get permission for renewable energy projects (and nuclear power plants) and give the government control over the energy grid. But Miliband’s uncomfortable assertion of his government’s powerlessness elides a deeper problem. Labour’s faith in markets and its allergic response to any whiff of economic centralism stands in the way of Britain meeting its own renewable energy targets–30 percent by 2020. "The difficulties are partly ideological, with Britain increasingly taking the view that the solutions to these problems are market based," says Tony Juniper, a longtime environmental campaigner and former executive director of Friends of the Earth. "In Denmark, Germany and even Spain there’s been a great deal of state intervention; that’s why they’re way ahead." For all Labour’s early talk about "joined-up thinking," it’s obvious that on climate change the government’s right hand doesn’t know, or doesn’t want to know, what its left hand is doing. Jonathon Porritt, former chair of Tony Blair’s Sustainable Development Commission, says that key departments are still committed to "the old way of doing things" and to the large energy companies: "Without Ed Miliband coming in and banging heads together and saying this is unacceptable, we would still be back there…. The Treasury remains unpersuaded that you can have a productive economy and go low-carbon." Environmental campaigner and author George Marshall has a more hard-nosed view of the Treasury’s reluctance: "The UK is setting itself up as the international carbon-trading capital. Two of the largest oil companies are based in Britain, as well as big mineral companies like Rio Tinto; you have to understand the policy in that context. Trading is what you do when you don’t want to touch the supply." There are lessons to be drawn from Vestas for the movement, too. The occupation was hailed as a breakthrough for red-green organizing, but it’s easy for climate campaigners to make common cause with workers in green jobs. The challenge is to engage with those who have the most to lose from a low-carbon transition: power-plant workers and oil company employees, aviation technicians and airport catering staff, people who live on the edge of fuel poverty or who can barely afford a cheap flight to somewhere warm. The earnest young Trots from Workers’ Climate Action who went down to Vestas succeeded in mobilizing a workforce who had never before taken action, and in pushing the government to put up funds for new wind-power research. But their stiff rhetoric of "class-conscious worker-led action" and "environmentalist working-class socialist revolutionary politics" may not wash so well in a less friendly setting or with more seasoned unions. Heathrow Airport is the biggest single-site employer in Britain; the national leaders of two of Britain’s largest unions, GMB and Unite, are in favor of a third runway. Despite efforts by some activists and the local left-wing Labour MP, John McDonnell, to listen to their concerns, the airport’s clerks and cleaners have not rushed to join in the protests there. Nor have the workers at coal-fired power plants been in a hurry to welcome a bunch of middle-class hippies who’ve come to shut them down. In fact, the trade union movement has been doing its own unglamorous work toward a low-carbon transition, taking some inspiration from American pioneers like OCAW’s Tony Mazzocchi. Paul Hampton writes on health, safety and environmental issues for the trade union-funded Labour Research Department; his recent survey of union representatives found many of them promoting green practices in their workplaces. "For union reps," he says, "this is going to grow as a political issue because of what the government and employers are doing." In every previous economic shift, from the Industrial Revolution to the closure of Britain’s coal mines to globalization, working people have been treated as expendable. Just transition, he points out, "is still a contested concept, plastic enough to host a number of different interpretations. The government’s version is predominantly market driven, but you could envisage a worker-led version that’s much more bottom up." It’s for that reason that George Marshall’s Climate Outreach and Information Network has launched a project called Climate Solidarity–with some government funding–to engage rank-and-file union members in the issue of climate change. "There’s been a total and systematic failure by the progressive left to take this issue on until very recently," says Marshall. "This is the biggest social and equality issue of all time–and our challenge to the unions is, Why have you handed it over to people you see as a bunch of middle-class tree-huggers? Greening the trade unions is the wrong way to think about it–what it’s really about is bringing a left-wing union perspective to climate change." Kevin Smith, a Climate Camp veteran, makes a parallel argument: "We need to move beyond the whole conservation issue and see climate change in terms of power relations: what are the vested interests preventing us from moving forward?" The climate movement, in all its biodiversity–from direct-action groups to traditional NGOs, from local transition towns to national campaigns, from academic researchers to community organizers–is coming out of the ghetto. Increasingly, climate change is understood as a social and political issue, a matter for mobilization, not individual choices. But the movement–and part of the government–is a long, long way ahead of most of the population, for whom climate change remains an abstract anxiety; though they "believe" in it, they are much more concerned about rising fuel costs and supermarket prices. For all Ed Miliband’s efforts to paint a rosy picture of a low-carbon future, to the majority the issue still smacks of Puritanism, smugness and self-denial. It’s depressing, tedious, trendy; the government is hypocritical; there’s no point in giving things up if the United States, China and India aren’t going to do their bit.